First ScotRail was a train operating company in Scotland owned by FirstGroup which operated the ScotRail franchise from October 2004 until March 2015. Prior to October 2004 trains were run by ScotRail (National Express). It was succeeded by Abellio ScotRail in March 2015. It operated most commuter and long-distance services within the country as well as some cross-border services to England, including the Caledonian Sleeper. Of FirstGroup's four train operating companies, ScotRail was the second largest (in terms of number of passenger journeys 2013–14) after First Great Western at the time of closure. National Express operated the ScotRail franchise from March 1997 until October 2004 as ScotRail. On 1 January 2006, Transport Scotland was created to carry out the Scottish Executive's transport responsibilities including its then newly devolved powers over rail franchising. In April 2008, Transport Scotland granted First ScotRail a three-year franchise extension until November 2014. 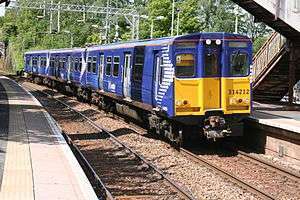 In September 2008, Transport Scotland announced that all First ScotRail trains, including those previously operated on behalf of the Strathclyde Partnership for Transport, would be repainted in a new blue livery with white saltire markings on the carriage ends. The rebranding put less emphasis on the First and is marketed as "ScotRail: Scotland's Railway". The first unit to receive the new livery was 170434, unveiled at Glasgow Queen Street on 22 September 2008. On 8 October 2014, First ScotRail confirmed its bid to retain the franchise had been unsuccessful and that the franchise transferred to Abellio ScotRail on 1 April 2015. On the evening of 31 March 2015, the Caledonian Sleeper services were split into a new franchise, operated by Serco. Express trains operated between Edinburgh, Glasgow, Inverness, Dundee and Aberdeen. The Highland Main Line links Inverness to the south. Some stretches of main line, such as the Highland Main Line, are single track, and express trains must call at intermediate stations to permit trains coming in the opposite direction to pass. The North Clyde Line is now linked to the Edinburgh-Bathgate Line (see Edinburgh, below) with the completion of the Airdrie-Bathgate Rail Link, creating a new direct link between Glasgow and Edinburgh. There is also a proposal to create a new rail link across the city with the Crossrail Glasgow project. The Edinburgh rail network is being expanded with the construction of the Waverley Line to the Borders, and the Edinburgh-Bathgate Line has been extended by the Airdrie-Bathgate Rail Link. A project to open a rail link to Edinburgh Airport was cancelled in September 2007 by the Scottish Government in favour of construction of a station at nearby Gogar which will connect with the Edinburgh tram network to take passengers to the terminal. A proposal to re-open the Edinburgh suburban railway line has been made by campaigning groups. 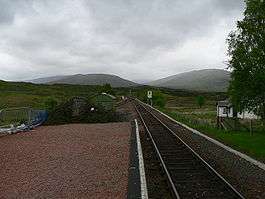 Rural lines include the scenic West Highland Line, Kyle Line and Far North Line. These lines carried more passengers, mostly tourists, during the summer months, but provided a valuable link and social service during the winter months. Many rural lines are single track. Trains terminating at the coastal towns of Oban and Mallaig connected with the Caledonian MacBrayne ferry services to Skye, Colonsay, Lismore, Islay and the Outer Hebrides and Inner Hebrides. 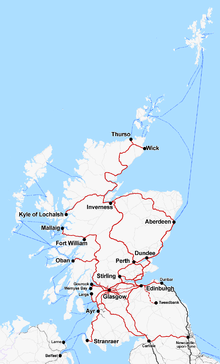 First ScotRail operated some services that ventured south of the border: principally the Caledonian Sleeper to London Euston along the West Coast Main Line, and a three times daily cross-country service between Newcastle upon Tyne and Glasgow Central via Carlisle and Kilmarnock. FirstGroup started operating the franchise on 17 October 2004. The percentage change figures are not the actual increases in % but the percentage increase in the % value. These values are very similar to the sector performance level. In June 2009 a report by Strathclyde Partnership for Transport revealed passenger figures from ScotRail contain 7.2 million more passenger journeys than were actually made. Transport Scotland said this gross overestimate did not affect the decision to extend the franchise (the franchise having been extended under controversial conditions in 2008). In 2014 ScotRail gave a woman only £10 compensation after a suitcase fell on her, breaking her ribs. First ScotRail inherited a fleet of Class 150, Class 156, Class 158, Class 170, Class 314, Class 318, Class 320 and Class 334s from National Express, as well as Mark 2 carriages and Mark 3 sleepers for use on the Caledonian Sleeper. First ScotRail contracted EWS to haul the Caledonian Sleeper services. Class 90s were used south of Edinburgh and Glasgow Central with Class 67s used on the portions to Fort William, Aberdeen and Inverness. A dedicated pool has been created due to the need to fit cast steel brakes. Three Class 90s were repainted in First ScotRail livery with EWS logos. First ScotRail took the delivery of the last few Class 170 Turbostars when it took over the franchise. These released the Class 150s for transfer to Arriva Trains Wales in late 2004 / early 2005. During 2005 the Edinburgh - North Berwick Line services were operated by English Welsh & Scottish Class 90s with former Virgin Trains Mark 3 carriages and a Driving Van Trailer. In late 2005, five Class 322s were transferred from One to replace these. 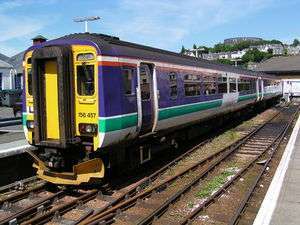 In 2007, First ScotRail received eight Class 158s from First Great Western, Northern Rail and South West Trains. From December 2008, ScotRail operated a set of DB Schenker Mark 2 carriages on a peak-hour Fife Circle Line service hauled by a Class 67. A second set was operated for a while. In July 2008, Transport Scotland funded the acquisition of 22 three-carriage and 16 four-carriage Class 380 Desiros with the first entering service in December 2010. These trains operated Ayrshire and Inverclyde services, adding extra capacity and allowed the cascade of existing stock to the new Glasgow to Edinburgh services via the reopened Airdrie to Bathgate line. The majority of Scotland’s 340 passenger stations were operated by First ScotRail under Network Rail ownership. Glasgow Prestwick Airport station is owned and operated by the airport, Dunbar is operated by East Coast, and Edinburgh Waverley and Glasgow Central by Network Rail itself. ScotRail operated Lockerbie railway station but none of its services called there. First ScotRail's fleet was maintained at Edinburgh Haymarket, Glasgow Shields Road, Corkerhill and Inverness depots. In early 2005 the rebuilt Glasgow Eastfield reopened. In June 2012, the Scottish Government announced that when the franchise is retendered in 2014, the Caledonian Sleeper services would be transferred to a standalone own franchise, which has been operated by Serco since April 2015. In October 2014, it was announced First had been unsuccessful in its bid to retain the franchise, which was taken over by Abellio ScotRail on 1 April 2015. Abellio ScotRail took over the franchise, as planned, at midnight on 1 April. Several hours prior to that, during the evening of 31 March, the Caledonian Sleeper services had already been handed over to Serco. ↑ Dalton, Alastair (23 September 2008). 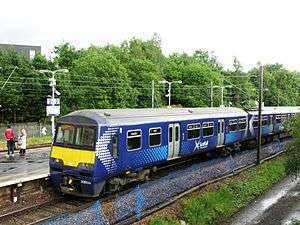 "ScotRail marks birthday with Saltire look". The Scotsman. Edinburgh. Retrieved 19 November 2016. 1 2 Airdrie-Bathgate rail link Archived September 28, 2011, at the Wayback Machine. ↑ "It's £30m down the drain". The Scotsman. Edinburgh: Johnston Publishing. 27 September 2007. Retrieved 7 September 2013. ↑ Capital Rail Action Group website Archived May 16, 2014, at the Wayback Machine. ↑ "Office of Rail Regulation - National Rail Trends" (PDF). ORR. ↑ "National Rail Trends Chapter 2" (PDF). ORR. 1 2 "National Rail Trends Chapter 2" (PDF). ORR. ↑ "National Rail Trends 2010-11. Chapter 2" (PDF). ORR. ↑ "Probe call over passenger figures". BBC News. 2009-06-24. Retrieved 2010-04-02. ↑ "Rail contract handling defended". BBC News. 2009-01-14. Retrieved 2010-04-02. ↑ "Scotland orders Desiro fleet". Railway Gazette International. July 11, 2008. ↑ Barrow, Keith (22 June 2012). "Scottish government sets out rail strategy". International Railway Journal. Retrieved 15 November 2015. ↑ "Serco wins franchise for Caledonian sleeper train service". BBC News. 28 May 2014. 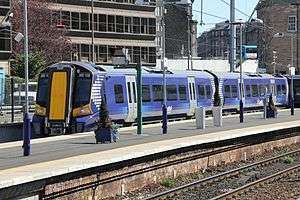 ↑ "Dutch firm Abellio wins ScotRail franchise from FirstGroup". BBC News. 8 October 2014. Scottish Government. Scottish Transport Statistics No. 24: 2005 Edition. Accessed on October 2, 2005. Scottish Parliament Information Centre. Changes to the regulation of Scotland's railways. Accessed on October 2, 2005. RailBritain.com. First ScotRail fleet size as of December 2004. Accessed on October 2, 2005.